Kilts to tails! Rt. Wor. Alexander D. Campbell of East Kingston, New Hampshire, faces that change in wardrobe in 2008 as he assumes the Grand Lodge South. It won’t be an uneasy transition to his more formal attire; he has spent many years in Masonic tuxedos and U.S. Navy uniforms. Bro. Campbell will be squeezing a Warden’s truncheon in 2008 instead of, or maybe in addition to, the bagpipes as a member of the Aleppo Temple Pipe Band and the Worcester Scottish Hirams. Born in Johnson City, New York, in 1945, Bro. Campbell majored in Mechanical Technology at Alfred State College in Alfred, New York, and studied electronic and computer systems at the Great Lakes Naval Training Center and the National Security Agency. After college, he joined the Navy and achieved the rank of Petty Officer First Class, serving as a communications technician in West Germany, Hawaii and Winter Harbor, Maine, which helped to prepare him for a career in computer services, including computer networking and internet web page programming with Siemens Business Systems, from which he retired in 2006. 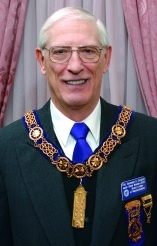 The Junior Grand Warden has been active in the Masonic fraternity since he joined United Brethren Lodge, Marlborough, in 1985. In addition to serving that lodge twice as Worshipful Master, he served as Secretary of Rose of Sharon Lodge for twelve years. Rt. Wor. Bro. Campbell is a graduate of the Masonic Leadership Institute and has served the Blue Lodge fraternity as President and Treasurer of the Marlborough Masonic Temple Association, a candidate instructor in the Lodge of Instruction, President of a Masonic Forum and District Deputy Grand Master (1998–1999). In addition to serving as Potentate of Aleppo Shrine, Wilmington, he has been active in the Scottish Rite Valley of Worcester, as a cast member, degree director, Most Wise Master of Lawrence Chapter of Rose Croix (2000–2001), and Deputy’s Representative to the Valley (2006–2007). He has been elected to receive the 33° in Providence, Rhode Island, later this year. Brother Campbell and his late wife, Cheryl, have two sons, Scott and Mark. This page was last modified on 8 January 2017, at 01:47.